Tempest is a 1981 arcade game by Atari Inc., designed and programmed by Dave Theurer. It takes place on a three-dimensional surface, sometimes wrapped into a tube, which is viewed from one end and is divided into a dozen or more segments or lanes. The player controls a claw-shaped spaceship (named Blaster) that crawls along the near edge of the playfield, moving from segment to segment. Tempest was one of the first games to use Atari's Color-QuadraScan vector display technology. It was also the first game to allow the player to choose their starting level (a system Atari dubbed "SkillStep"). This feature increases the maximum starting level depending on the player's performance in the previous game, essentially allowing the player to continue. Tempest was one of the first video games to sport a progressive level design in which the levels themselves varied rather than giving the player the same layout with increasing difficulty levels. Enemies swirl around at the far end of the playing field, then enter the playing field and move toward the player. When all enemies in a level are destroyed or reach the player's end of the playing field, the player "warps" to the next level by traveling down the playing field. As the player warps to the next level, he or she must avoid or shoot away any spikes. The player loses a ship when an enemy comes into contact with their ship, shoots it or otherwise destroys it, or if the ship hits a spike while warping. The player earns a new ship at certain point thresholds, and may hold up to six ships at once. The game is over when the enemies destroy all of the player's ships. There are multiple types of enemies, each of which has a different behavior pattern. At higher levels, some enemies place spikes in the middle of the lane. These spikes travel toward the player and destroys it upon contact when the player warps out to the next playing field. Other enemies travel towards the player's end of the playing field while firing at the player, and then flip from lane to lane, killing the player if they move onto the lane that the player is on. Firing while this type of enemy is changing from an adjacent lane kills it. The game features sixteen unique geometric shapes for the playing fields, some of which are closed tubes that allow the player to loop around, while others are open fields that have distinct left and right endpoints. When all sixteen screens have been played, the sequence repeats with a different color scheme and a higher difficulty level, including the invisible (black) levels (65–80). Each sequence of levels adds additional faster, deadlier enemies. After level 99, the level number stops incrementing, and one of the 16 variations will randomly appear after each player death or the successful completion of subsequent levels. The game was initially meant to be a 3D remake of Space Invaders, but early versions had many problems, so a new design was used. Theurer says that the design came from a nightmare where monsters crawled out of a hole in the ground. During the prototype stages the game was entitled Aliens, then Vortex, and finally titled Tempest. Three different cabinet designs exist for Tempest. The most common cabinet is an upright cabinet in the shape of a right triangle sitting on top of a rectangle, when viewed from the side. This cabinet sported colorful side art. A shorter and less flashy cabaret-style cabinet was also released with optional side art. A cocktail-style table cabinet allowed two players to play at opposite ends of the table; the screen automatically flipped for each player. In the first games Atari shipped there were glitches in one or more of the ROM chips. The problem code allowed a player to do unintended things when ending their score in certain 2 digit combinations. According to Joystik magazine, which detailed these combinations, the most useful were the ones that earned the player 40 free credits (06, 11, 12, 16, 17, 18) and the "jump to green" trick (46). Another useful combination mentioned was 05 which allowed the player to play the game in the attract mode. In this scenario pausing at one the combinations would cause the effect to take place immediately without losing the balance of the player's lives. Also, in the attract mode, pausing at an end score of 48 gave the player 255 extra lives. After this issue was discovered, Atari corrected the problem so that further shipping machines were incapable of allowing the end score tricks. It was also noted in Joystik that Atari shipped updated chips to be replaced in the field. An official port was released for the Atari ST. An official port that bears the Atari logo was released by Superior Software for the BBC Micro and Acorn Electron in 1985, and another by Electric Dreams for the ZX Spectrum and Amstrad CPC in 1987. Versions for the Atari 2600 and 5200  were in the works in Atari, Inc. during 1984, unfinished prototypes exist for both of them. Chris Crawford wrote in 1982 that unlike Pac-Man, Tempest "intimidates many beginners because it appears to be unwinnable"; its smoothly increasing difficulty, however, encourages players to continue playing. In 1996, Next Generation listed the arcade version as number 74 on their "Top 100 Games of All Time", commenting that, "It's very fast, it has abstract, color vector graphics that remain unequaled to this day, and its novel 'paddle' controller makes playing Tempest effortless. The game's difficulty advances smoothly, and the play is extremely well balanced." Tempest is #10 on the KLOV's list of most popular games, tied with Centipede. The game has been cited as an influence on the careers of video game designers Jeff Minter and John O'Neill. Shortly after the original game was released, an arcade owner named Duncan Brown hacked the level data and made an altered, more difficult version: Tempest Tubes. It was eventually included with Tempest in the Hasbro compilation Atari Arcade Hits: Volume 1 for PC in 1999. Jeff Minter created two authorized sequels, released long after the original game: Tempest 2000 (1994) for the Atari Jaguar (renamed Tempest X3 for the PlayStation port), and Tempest 3000 (2000) for Nuon enhanced DVD players.In July 2018 Tempest 4000 was released for multiple platforms. Minter also wrote two games inspired by Tempest: Space Giraffe (2007) and TxK (2014) After TxK was released for the PlayStation Vita, the current incarnation of Atari blocked release of the game for additional platforms. The game was released for Microsoft Windows 3.x as part of the Microsoft Arcade package. It has 14 secret levels. The original Tempest was included as part of Arcade's Greatest Hits: The Atari Collection 1 for the PlayStation, Sega Saturn, and Super NES. In 2001, Infogrames and Digital Eclipse ported 12 Atari arcade games (one of them being the original Tempest) under the compilation title, Atari Anniversary Edition released for PC and Dreamcast, a PlayStation compilation titled, Atari Anniversary Edition Redux, was also released with the same number of games plus two exclusives to the Redux edition. A handheld compilation released in 2002 titled, Atari Anniversary Advance was released for the Game Boy Advance with half the number of games of the console compilation, Tempest is still included on the handheld compilation though. In 2005, the original Tempest is part of Atari Anthology for the Xbox and PlayStation 2; the PC version also includes the Atari 2600 prototype. The 2600 port was also released as part of the Atari Greatest Hits compilation for Nintendo DS and iOS devices. Also in 2005, a port and graphical "remix" of the original Tempest was included as part of Retro Atari Classics for the Nintendo DS. This version deviates significantly from the basic rules and experience of the original game. On December 19, 2007, Tempest was released for Xbox 360, available for purchase through Xbox Live Arcade for 400 MS Points. This version includes the original arcade game (emulated) and an "evolved" version with updated graphics. After the unfinished 5200 prototype was found in 1999, its original programmer, Keithen Hayenga, resumed work on finishing the port. It was published by AtariAge in 2013 for US $50. 1980s home computer clones include Storm for the Dragon 32 published by Microdeal in 1982, Web War for the Acorn Electron and BBC Micro published by Artic Computing in 1985, Tubeway (1982) for the Apple II, Storm (1984) for the Tandy Color Computer, and Livewire!, an Atari 8-bit family type-in game printed in ANALOG Computing in 1983. The Tempest-inspired Axis Assassin (1983) was one of the first five releases from Electronic Arts. Arashi is a 1992 freeware clone for the Apple Macintosh running classic Mac OS. Whirlwind (1994) is a commercial game that Computer Gaming World described as "a clone of Tempest". Tempest is featured as the video game that Reggie (Catherine Mary Stewart) plays in the 1984 film Night of the Comet, and the game serves to introduce a standing thread throughout the movie. While at the movie theater that saves her from exposure to the comet, she becomes obsessed with knocking someone with the initials "DMK" off the high score list. Additionally, the identity of "DMK" is revealed at the film's conclusion when another survivor suddenly appears with the custom license plate of "DMK". Tempest is featured prominently in the music video for Rush's 1982 song "Subdivisions". Parzival must beat Anorak's high score of 728,329 on Tempest (1980 cabinet) in the first part of the final challenge inside the Crystal Gate in Ernest Cline's book Ready Player One. Peter MacNicol's character, Larry Fleinhardt, in the television series, Numbers is seen playing Tempest in an arcade as he is advising Charlie Eppes (played by David Krumholtz) on a mathematical problem in the pilot Episode. Larry is later seen playing the game again on a laptop in the season four episode "End Game". In the American Dad! episode "The Vacation Goo", Klaus is shown with an original arcade cabinet he bought from eBay. John Grant included a song called Tempest on his 2018 album Love is Magic which not only repeatedly references the video game, but also includes sound effects. ^ Hague, James (1992). "The Giant List of Classic Game Programmers". Dadgum Games. Retrieved 16 April 2019. ^ Therrien, Carl (December 2015). "Inspecting Video Game Historiography Through Critical Lens: Etymology of the First-Person Shooter Genre". Game Studies. 15 (2). Retrieved October 16, 2017. [Tempest] corresponds to a third-person shooter, by contemporary standards. ^ Joystik Tricks of the Trade (Sept 1983, Vol. 2, No. 1 ed.). 3841 W. Oakton St., Skokie, IL: Publications International, Ltd. September 1983. p. 60. ^ Reichert, Matt. "Tempest (Atari 2600)". AtariProtos.com. Retrieved 2013-02-08. ^ Reichert, Matt. 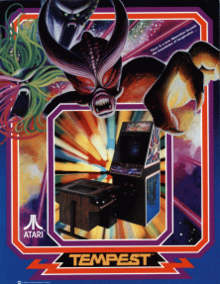 "Tempest (Atari 5200)". AtariProtos.com. Retrieved 2013-02-08. ^ "Galaga". Rovi Corporation. Archived from the original on 14 November 2014. ^ Crawford, Chris (December 1982). "Design Techniques and Ideas for Computer Games". BYTE. p. 96. Retrieved 19 October 2013. ^ "Top 100 Games of All Time". Next Generation. No. 21. Imagine Media. September 1996. p. 44. ^ Forman, Tracie. "Inside Gaming - John O'Neill: The Dali of Computer Gaming." Electronic Games. Vol.2, No.13. Pp.64-65. July 1984. ISSN 0730-6687. ^ Machkovech, Sam (17 July 2018). "Tempest 4000 finally lives after delays, legal threats—but what's up on PC?". Ars Technica. Condé Nast. Retrieved 19 April 2019. ^ Parfitt, Ben (18 March 2015). "Atari blocks Jeff Minter from releasing new versions of TxK". MCVUK. NewBay Media. Archived from the original on 19 June 2016. Retrieved March 18, 2015. ^ "Microsoft Security Leak!". Read.Me. Computer Gaming World. June 1994. p. 15. ^ Yarusso, Albert (2013-02-07). "Tempest - Atari 5200". AtariAge.com. Retrieved 2013-02-08. ^ ""Web War" review, A&B Computing". Acorn Electron World. ^ "Atari 400 800 XL XE Livewire!". Atari Mania. ^ Corriea, Alexa Ray (May 21, 2013). "30 years ago Electronic Arts shipped its first batch of five games". Polygon. ^ "Arashi Source Code". GitHub. ^ Wright, Rob (2007-04-11). "The Top Video Game Scenes in Movie History - 12. Night of the Comet (1984): Hot Tempest Nights". Tom's Games. Archived from the original on 2008-04-11. Retrieved 2008-01-03. This page was last edited on 19 April 2019, at 00:38 (UTC).